Q: Your project in 1 sentence? A: Mobility as a service (MaaS) through connecting Ethereum smart contracts with Datastreams on IOTA. Q: What problem does your project solve? A: We wanted to develop a case in the field of autonomous urban air mobility, better known for example as the concept of air taxis. In order to implement such an autonomous mobility concept, you have to bring together different partners. Making an air taxi fly is actually a bit more complicated than sending an autonomous car into traffic. Because you need some very important permission before you are allowed to start. There is, for example, the flight control that has to check all the details of your flight to make sure that there is no other vehicle on the same route. Or the weather forecast service telling you if the conditions are okay for your flight. In addition to the permits, there are also other stakeholders, who should be integrated into the process. What about the insurance company offering real time insurance conditions depending on how much passengers you have and how long your flight will take? Or the booking platform where everybody can book easily his flight in an air taxi? So, at the end, it just makes sense to involve all parties in smart contracts on blockchain to automate as much processes as possible. And this is what we did. Q: What expertise and roles do your team members have? A: In our team we were one designer and two backend developers with numerous experiences in blockchain projects. Q: Which technologies do you use for which purposes? A: Mainly we used all kind of Ethereum based smart contracts, to bring the different participants together on a decentralized network. 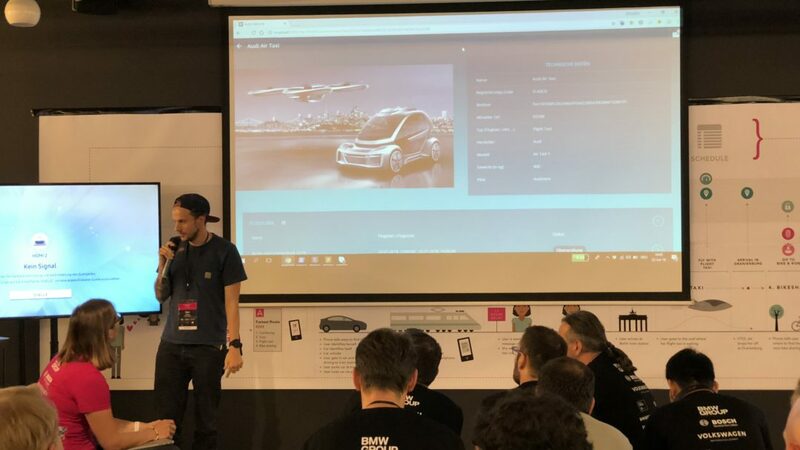 To get real time data of the air taxi we used the data streaming technology of IOTA. In our case, we created a process that opens a new data stream automatically in the moment in which the air taxi starts. From this point on we push the data stream in our Ethereum based smart contracts. To show the connection between IOTA and Ethereum, we used the data of the battery of the air taxi. The battery will be a very critical point for every autonomous process in the future. Because, while the air taxi is flying, the partners around, like for example the market places where you can book your air taxi, need the information when the air taxi will be available again for the next flight. And that is highly depended on the current status of the battery. So, to know in advance how long the air taxi has to charge after the flight before it can go back in the air, you need real time information about the battery condition. Q: How do you plan to proceed with your project? A: We will use the developed demo to show, what type of use cases you can implement at evan.network.